In 2002 Elke moved to South Africa to start a new phase of life. Having been a successful international business woman, she wanted to share her knowledge and resources. She knew little about the traumatic history of apartheid and the brutal impact of racism in the country. To serve to lead – supporting South African women to succeed was the motto of the social entrepreneurship organisation she created. The book is a powerful testimony of successful women entrepreneurs in spite of the huge challenges faced by them in a still deeply divided country. Little did Elke know that soon she would face a deeply jarring crisis, profoundly challenging her white western identity and values which seemed ill gotten in the context of white society’s racism and the brutal exclusion and oppression of black South Africans. The book tells with shocking honesty how she reached a breaking point, realizing that once again she belonged to the culture of perpetrators. She struggles with white society’s denial, silence, blaming and selfish protection of false privilege; it felt so painfully similar to post Nazi Germany from where Elke fled as a young adult, feeling such shame and guilt about her parents participation and her struggle with ‘loving parents and their evil choices’. 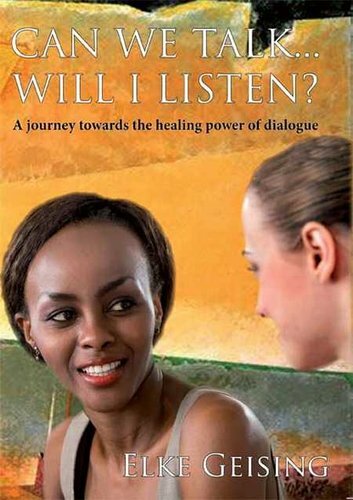 The book describes a gripping journey towards the healing power of dialogue. She meets amazing black South Africans, generous, dignified and accomplished who offer her guidance and embrace her in friendship and love. In that process, Elke shifts from anger and resentment into taking responsibility beyond shame and guilt as a descendant of Nazi parents and today as an undeservedly benefitting white South African. Together with a deeply committed Jewish educator Elke starts inter-racial dialogue sessions with school groups, students, teachers and scholars at the Holocaust Centre in Cape Town. Elke’s narrative is an moving account of conversations between people of diverse backgrounds, sharing their deep seated pain and shame.